Pioneers in the industry, we offer rubber wear liners from India. FORECH-HILTON offers a wide range of Wear Resistant Elements in various dimensions, with thicknesses from 30 to 150 mm. These elements are designed as modular units to facilitate quick and easy replaceability of a worn out element from an entire chute, hopper or a truck-bed. Each element is made of a rubber plate, which is bonded to a 5mm - 10 mm thick steel plate, depending on the overall thickness of the total element. This provides the element with secure fastening. 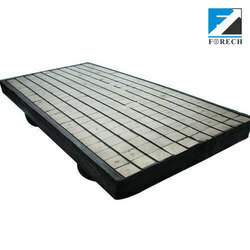 FORECH-HILTON Wear Resistant Elements are made of a very high-quality wear-resistant rubber grade developed specially to meet the mining and mineral processing industries' need for economical, high performance wear protection systems. These products have a high wear strength and provide a long service life, which results in less downtime and even lesser maintenance costs.FORECH-HILTON Wear Resistant Elements are easy to handle and drastically reduce noise and vibration when installed and prove to be much more economical when compared to steel liners. Forech Wear Liners offer excellent wear protection in tough conditions such as primary chutes, truck beds, bins, and hoppers. Forech Wear Liners are resistant to all PH values and types of water and to most oils in small concentrations.